U.S. Secretary of State John Kerry got a firsthand look into how climate changes impact the melting glacier in Kongsfjorden on Norway’s Svalbard archipelago. Kerry toured Svalbard on Thursday with Norway’s Minister of Foreign Affairs Børge Brende and head of the Norwegian Polar Institute Jan Gunnar Winther. In Kongsfjorden, not far from the world’s northernmost science community settlement in Ny-Ålesund, Kerry was explained by Winther how the glacier melts away both due to increased atmospheric temperatures as well as warmer seawater in the Arctic. Last winter, Svalbard faced a heat wave never seen before with temperatures in periods nearly 8 degrees Celsius warmer than average in modern times. “Important to have Johan Kerry at Svalbard seeing with his own eyes that the Arctic is warming faster than any other region,” Brende said in a tweet from Svalbard after the voyage into Kongsfjorden where one of the many Arctic glaciers melts. “We’re going to learn more about the remarkable work that our scientists are doing to help the world understand how these changes in polar regions are going to affect every single one of us,” Kerry said in a joint meeting with Norway’s Prime Minister Erna Solberg before departure to Svalbard. 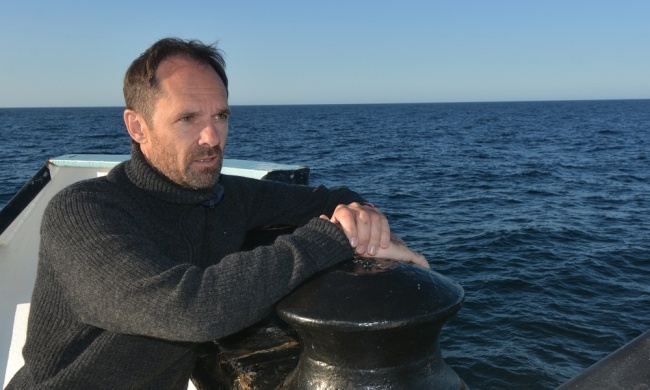 Jan Gunnar Winther with the Polar Institute is glaciologist and has been one of the leading scientists writing the latest reports for the UN Intergovernmental Panel on Climate Changes (IPCC). He could explain to Kerry that the glacier in Kongsfjorden has significantly receded in recent years. Just like many of the other glaciers in the circumpolar north; on Svalbard, in the Barents Region, Iceland and on Greenland. In an email to the Barents Observer, Jan Gunnar Winther says we have seen consecutively climate records in the north in recent years. “We see a climate normalization of conditions in Svalbard that is more and more like those we know from the coast of northern Norway. Unfortunately, the climate models suggest that this trend will continue,” Jan Gunnar Winter explains. The United States is currently chairing the Arctic Council and Secretary Kerry underlined the importance of joint international cooperation on climate changes. “We will highlight our partnership through the Arctic Council, which we will work very closely on,” Kerry said.